Female "Black K" was collected from the Carmarthenshire area of Mid-Wales. She was collected on the 19th June 2008 by Tony Cross of the Welsh Kite Trust. On the day of collection she weighed in at 893g. A nestling kite of that weight could be male or female, but Tony judged it to be a female given the thickness of its tarsus (leg). She was ringed and brought back to Gigrin Farm, Rhayader, where she lived in the aviaries for the next three days before being brought back to Ireland on the 22nd June. On the 14th July "Black K" was fitted with its wing tags, tail mounted radio and solar powered satellite backpack. 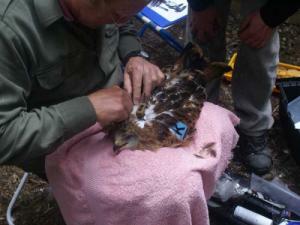 "Black K" was tagged by Dr. Marc Ruddock of the Northern Ireland Raptor Study Group. 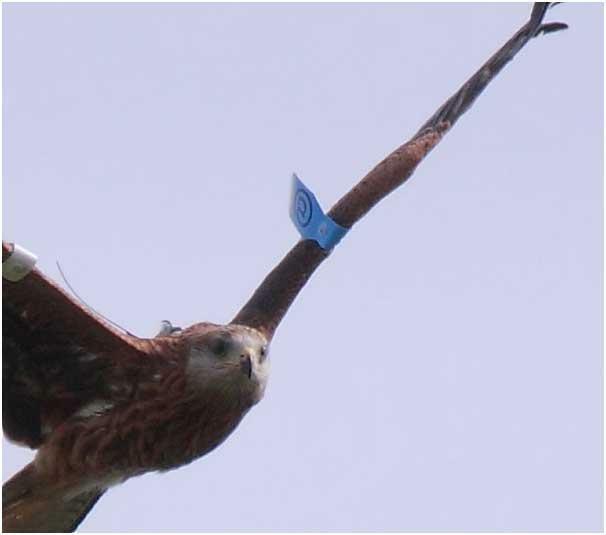 All 2008 birds got the same tags, with individual letters, so Marc fitted a blue tag on the left wing, indicating a Wicklow bird and a black tag on the right wing indicating a 2008 bird. "Black K" has a slightly heavier pack weighing 12g, compared to "Black T's" 9g pack. Both packs are well within the recommended weights for red kites. Prior to release the "Black K" weighed 1034g, confirming Tony's initial sexing of the bird. "Black K" was released on 24th July and has remained in the release area since. Female "Black T" was collected from the Carmarthenshire area of Mid-Wales. 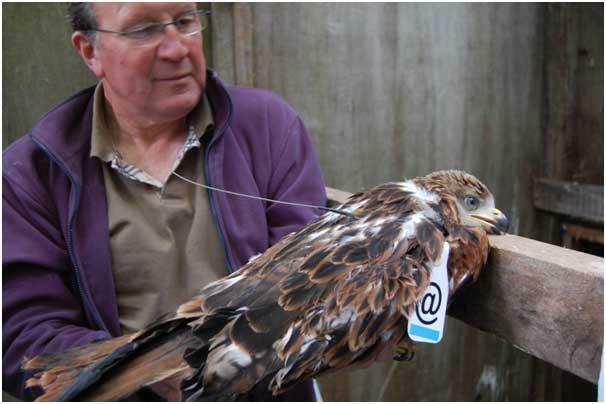 She was collected on the 19th June 2008 by Tony Cross of the Welsh Kite Trust. On the day of collection she weighed in at 1,030g, a definite female at that weight. She was then ringed and brought back to Gigrin Farm, Rhayader, where she lived in the aviaries for the next three days before being brought back to Ireland on the 22nd June. Interestingly, "Black T's" parents produced a white red kite last year. White red kites are particular to Wales and are a result of the limited gene pool from which the Welsh kites have come from. About one in every two hundred chicks in Wales is white. The correct term is leucistic. Perhaps "Black T" will produce white kites in Ireland. On the 14th July "Black T" was fitted with its wing tags, tail mounted radio and solar powered satellite backpack. 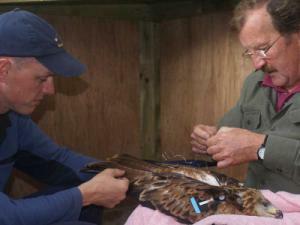 Lorcan O'Toole, project manager of the Golden Eagle reintroduction, fitted the wing tags and radio, and assisted Brian Etheridge in putting on the satellite pack. 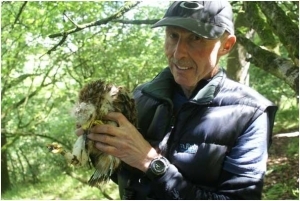 Brian has years of experience working on kites and other birds of prey in Scotland and is the current Scottish Raptor Monitoring Officer. "Black T" was well chosen for this job and lay quietly throughout the process. "Black T" was released on 24th July and has remained in the general release area since.